It's time to have some fun - San Antonio style! 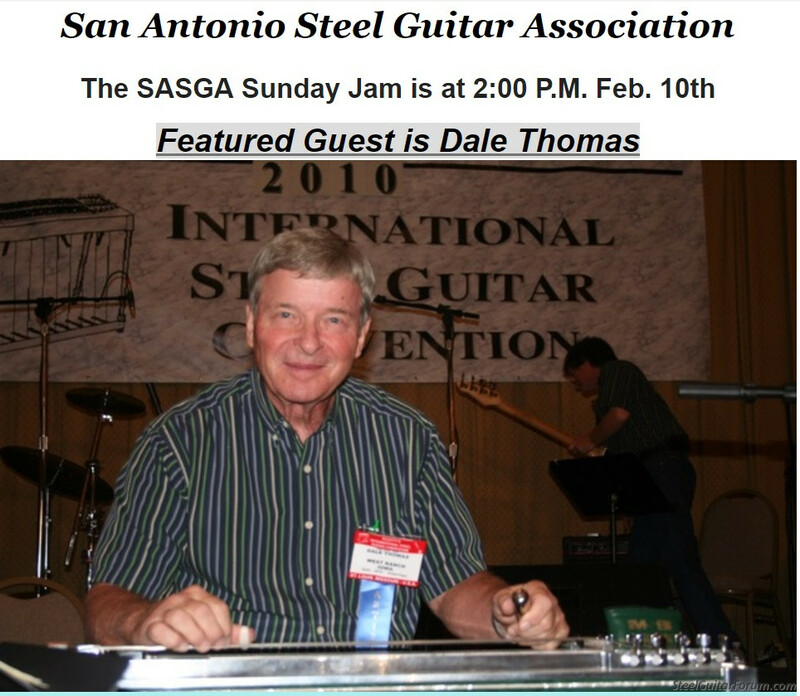 Our Guest performer will be Dale Thomas Feb. 10th at 2pm. Study Group meets 1st Sunday of the month. Our regular monthly jam is on the 2nd Sunday of each month in Converse, TX. Location : American Legion Post 593. 326 Legion Dr W, Converse, TX 78109 from 2:00 till 5:00. All steel players, regardless of skill level, are encouraged to bring their guitars and join in the fun. We will have our backup band, and the Legion has the best hamburgers in town! There is no admission fee and spectators are welcome. Feel free to contact for more information. CLICK HERE for more information or to sign up for our newsletters. CLICK HERE for SASGA Website. This was a Fantastic show to a packed house. Thanks Dale! Looks like we will be meeting as usual on the 2nd Sunday of March. Stay tuned for more details or sign up for our news letters.